After 10 years of traveling to China for trade delegations, the Economic Development Council’s efforts are finally paying off in solidifying expanded opportunities for business and investment in Thurston County. Michael Cade, Thurston County EDC Executive Director and trade mission participant, has been leading the yearly trips since 2006. The size, scope and progressiveness of the country and the forward-thinking nature of its people took Cade by surprise on his first visit. But as Cade soon came to realize, this was not about to be a one-and-done exchange. Building trust with Chinese counterparts is interpersonal and takes time to build. Unlike in the West, the creation of personal friendship is a prerequisite of doing business. The Chinese are known to operate under the concept of “guanxi” (pronounced GWAN-shee), which is defined as the system of social networks and influential relationships that facilitate business and other dealings. Or as Cade put it, trust built on time and respect. Leda Li, born in the Liaoning Province in Northeast China, was recently hired as International Business Development Director at the EDC. After getting her bachelor’s degree in Beijing, she moved to Olympia in 2015 to get her master’s from Saint Martin’s University, which is how she was first introduced to Cade. 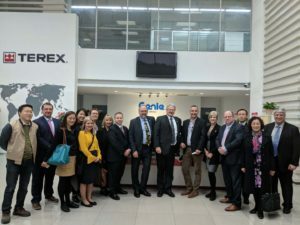 The most recent trade mission to China took place in March and included members of the EDC, delegates from Thurston County, representatives from Saint Martin’s University and Evergreen State College, and elected officials from the City of Olympia. 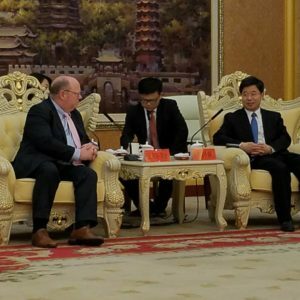 The purpose of the trip was to explore opportunities to expand trade and potential investments between Southwest Washington and China in order to strengthen both economies. The 12 local participants visited several areas and districts, including Beijing, Mianyang, Chengdu, Shanghai, Dantu, Zhejiang and Changzhou. According to the EDC newsletter, areas attracting the most interest for direct foreign investment included brewing and distilling, private school development, the IT/telecom industry and agriculture. 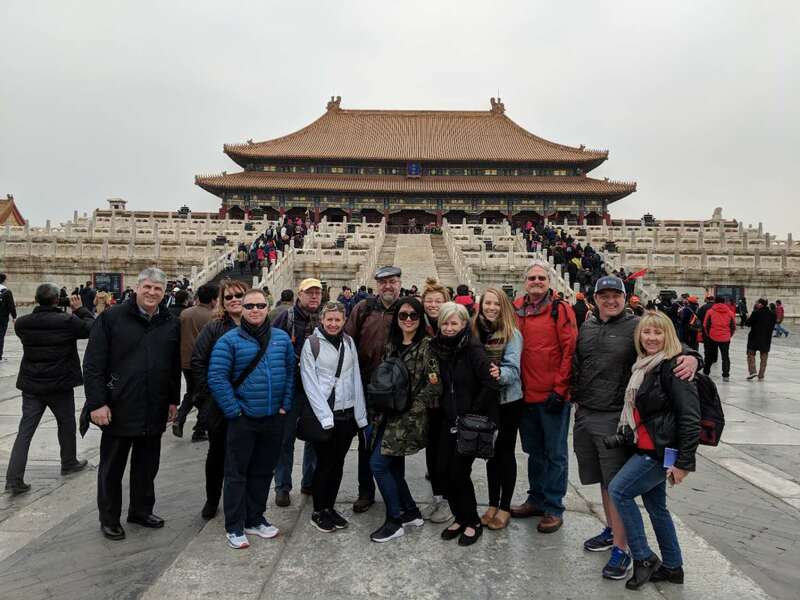 For Lisa Schlender, project specialist for SCJ Alliance, it was her first trade mission to China. She has been involved with the EDC for over a year and plays a supportive role to the board president. 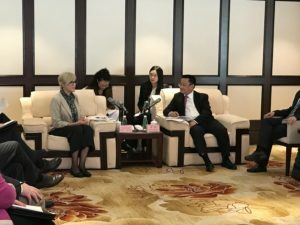 Representing a smaller town, she was impressed how seriously the Chinese businesses and government officials took the group. The 10-day itinerary was action packed, with most days filled with meetings with CEOs of major Chinese corporations, real estate and development companies, representatives from city governments, as well as technology leaders and educators. The meetings were extensive and productive in continuing to cultivate relationships between both Washington and China that will most definitely yield results in the near future. As Schlender put it, a business meeting is not just a formal meet and greet, but really an investment of time and energy. The EDC’s continued efforts have finally begun to pay off in the form of several investments and business proposals in Thurston County. 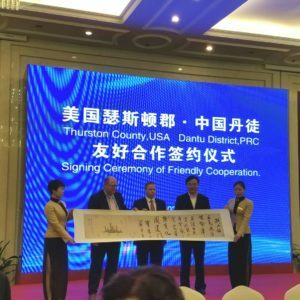 The Mianyang municipal government will be touring Thurston County in late May and there has been follow up from the City of Dantu regarding the “Memorandum of Understanding” that was signed during the trip. As well, Saint Martin’s University continues to attract students from China, most who end up staying, investing in the community and participating in local culture. Aside from just the economic opportunity these yearly trips provide, Cade says he’s become a more well-rounded person, not only in business but in life. Cade believes that business and economic development leaders need to be aware of changes in the Chinese economy as they will inevitably impact our economy and should consider the value of becoming global adversaries with that part of the world.